BinaryOptionsNow – SpotOption, one of the largest producers of binary option trading platforms, now offers traders the ability to liquidate binary option investments that have been executed. Now, traders can either cash in when an asset is trading in-the-money before the option’s expiry or minimize losses by dumping an asset that appears likely to finish out-of-the-money by the option’s expiry. Up until now, SpotOption platforms have not allowed traders to “sell” or be “bought out” of executed binary options positions. So, for example, if a trader invested $500 in a Call binary option on oil that expired at 2:00 PM with a 80% payout, he or she could not exit the position before the expiry time no matter if oil was trading above or below the strike price. In this way, traders were more restricted when trading binary options with SpotOption brokers. If an asset was dropping in value, they could not dump it and if it was climbing in value, they could not take profits. The sell option feature gives traders a price based on the current value of the binary option’s underlying asset when the sell option function is activated. If the asset is trading above a call option’s strike price, the sell value will be higher than the investment amount, allowing the trader to make a profit – albeit a smaller one than would be produced if the option were to expire in-the-money. And, conversely, if a call option’s asset is trading below its strike price, the sell value will be below the in-the-money payout, yet above an out-of-the-money expiry. Other binary trading platforms such as 24Option – powered by TechFinancials – and GFT have always allowed traders to exit out of binaries but SpotOption did not offer this feature until recently. In order to illustrate how the sell option feature works, I have chosen to use TradeRush, a popular binary broker that is powered by SpotOption technology. In the example below, I executed a $100 Put on Gold on binary option with a 70% payout that expires at 11 AM. 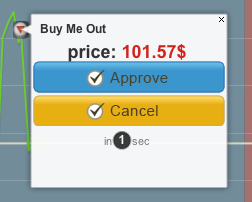 As you can see, I have until approximately five minutes before the option’s expiry to sell the option if I choose. 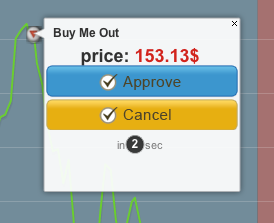 In order to sell the option, I simply have to click the small sell icon next to the option below the graph (not show above). As Gold trades below the strike price, the sell value of the option increases reaching all the way up to $153.13. Then, when Gold trades around the strike price, the sell value of the option drops to $101.57, very close to my initial investment of $100 in the option. In this example, I decided not to sell my option and the option expired in-the-money netting me a $170 payout for a profit of $70. The sell option feature is definitely a nice tool to have to make binary trading more flexible and cater to different types of traders. Traders fond of scalping will definitely enjoy this new tool as it enables one to enter and exit many binary positions in a short amount of time.